Greetings from the Crusader Monk shoppe. I've been wanting a nice stout langseax for sometime. 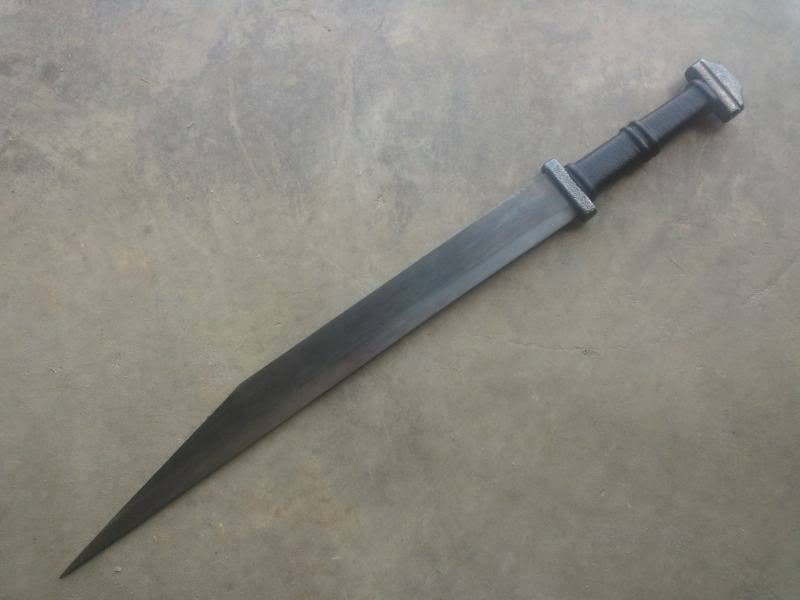 A couple months ago, I spoke with fellow forumite and bladesmith, Wes Beem about creating me a large seax blade with a nice long tang. The blade arrived in good time and in good order last week. Over the rainy weekend, I was unable to get any sanding done in the shoppe, so I was able to complete this monster. I named her, Dauðrnagl, which means Death Nail. 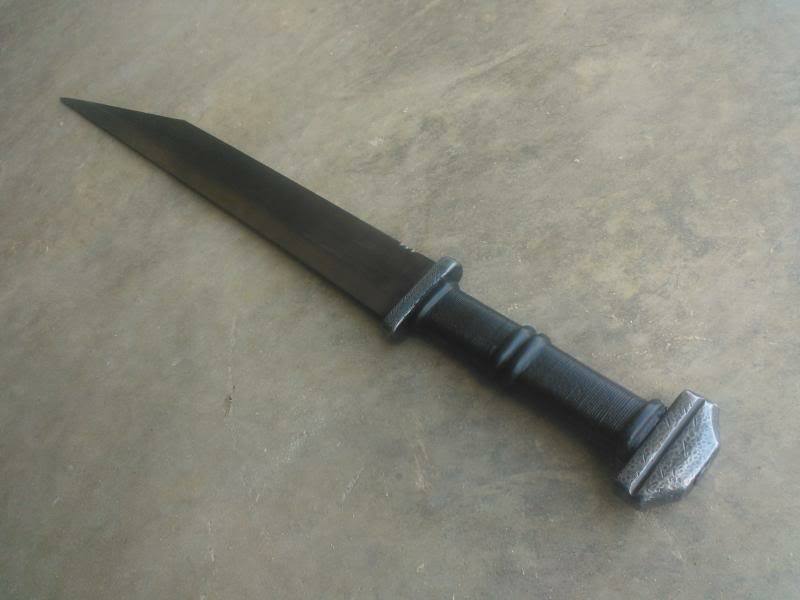 I wanted my seax to be significantly different than most others out there, so it is an integration of both historical and fantasy design elements into my own personally-appealing design. I was thinking along the line of 13th Warrior meets LoTR Dwarves meets historical Vikings for the look. A few weeks back, I ground the furniture out of mild steel on a wheel grinder and had my machinist cut the blade slot in the guard and tang hole in the pommel. I cleaned these up somewhat, then intentionally beat them up to give them a good antique look. I then heat-blued them and drew the finish back to a dull satin one, leaving the bluing within the pits and scratches on the pommel. When the blade came, it still had the fire scale on it; which I had requested. It was a little too uniform, so I cleaned off the scale and chemically aged the piece to a nice deep grey color. I then cleaned up the edge and gave the bevel an even satin finish. Using a file, I notched the blade three times on the rear of the spine for aesthetics. I fitted the pommel and guard (which amazingly fit nearly perfectly - I had cut the slots prior to the blades arrival). 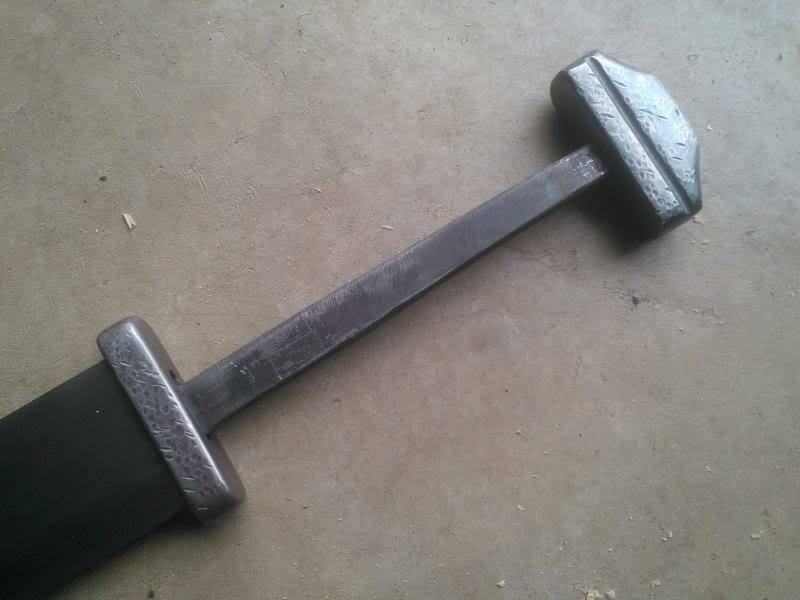 I wedged the guard into place then hot-peened the tang though the pommel for a solid fit. I did the grip scales and wrap the next day. 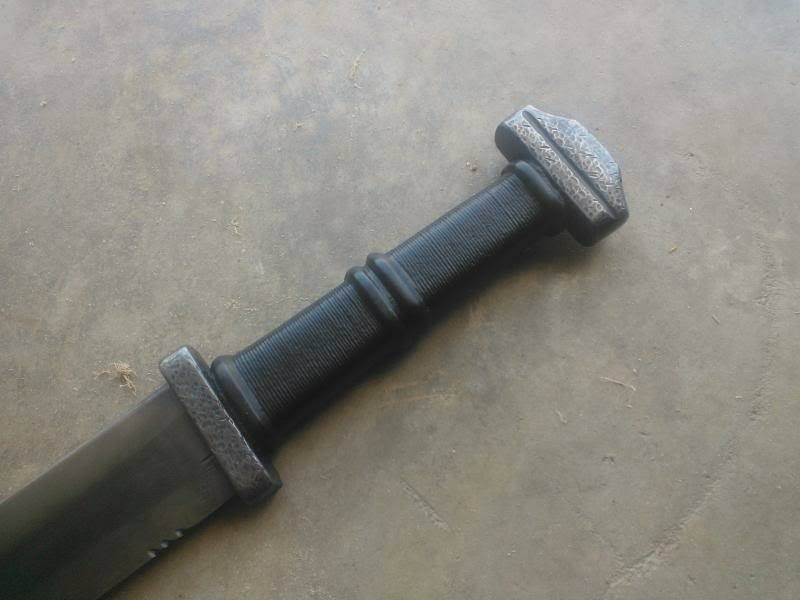 The original grip was rather austere, so I tore it off and re-did it with the same riser scheme I use on many of the Viking swords coming though my shoppe. I am quite happy with the overall look of the piece. It looks like something that could be found in the hands of a dwarf in the depths of Moria, at the side of Buliwyf has he fought off the Eaters of the Dead, or resting in the grave of a Viking warrior in the 9th century. It has been made to appear exactly what it is, an austere killing implement that looks as if it has a spirit of malice about it. In the hand, it's quite versatile. It has enough presence and weight to be used like a short sword, yet remains nimble enough to be used as a large dagger or in conjunction with a hand axe in the off-hand. 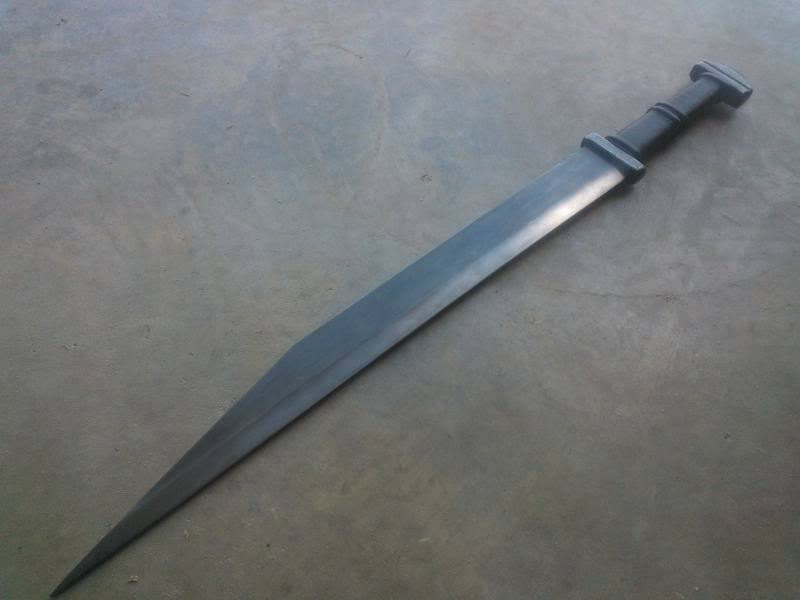 It's a vicious, no nonsense blade that would do it's job in either the fantasy or historical realms very efficiently. It's a brutal weapon, something made to fullfil it's one purpose without being pretty, ornate, or adorned. 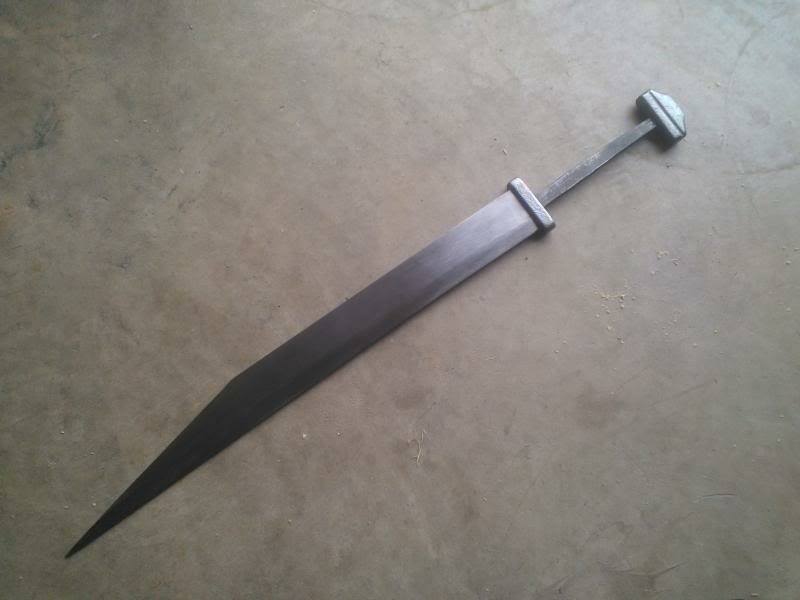 I am thinking creatively on the scabbard for this one, but I can tell you now, it will be just as unique as this piece is. I will update when I get it completed. 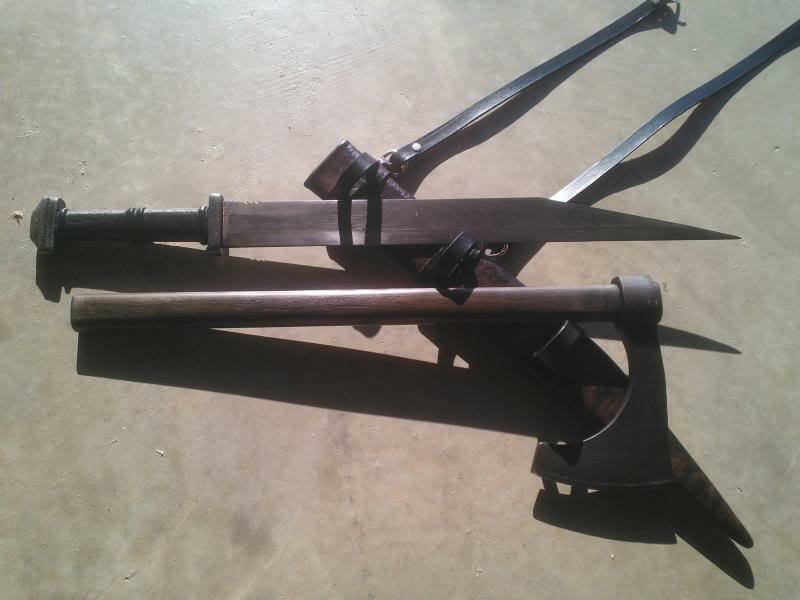 I usually prefer my seaxes hilted up all organic, sword -style fittings don't often do it for me, don't know why. This one is singing to me tho! 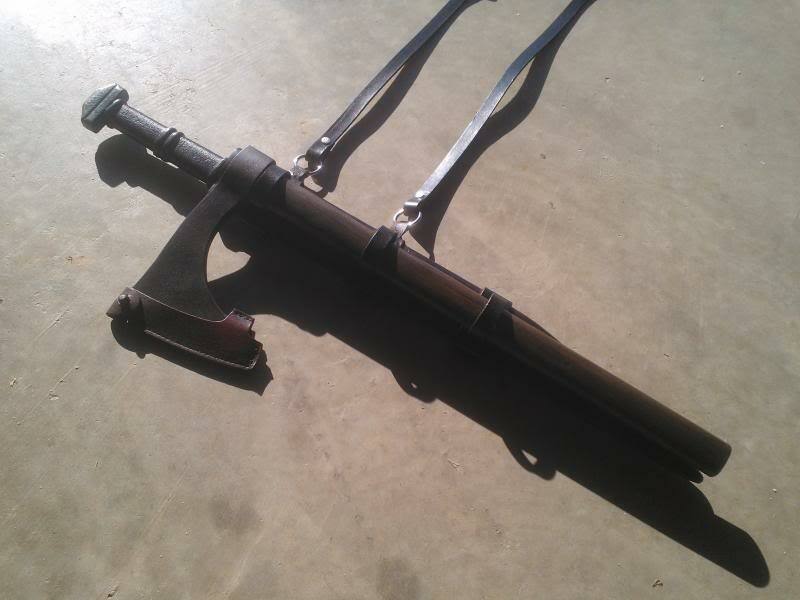 Maybe it's the extra hilt length. I really enjoy seeing "plausible fantasy" works, and the first thing I thought of when I saw the photos was how it might feel in one hand, short ax in the other, á la One Eye in Valhalla Rising. Very tough looking! Looking forward to the scabbard! Glad you like it Sarge, this one was really fun to make, even more fun to play with before i shipped it out, i slaughtered me a good sized water bottle army. No doubt this one would take a head in one swing. "There was a time boy, when i searched for steel, when steel meant more to me than gold or jewels"
I like that - it does have a certain LOTR feel to it. Really? The best you have ever seen? It has a certain brutal appearance, but the "best you have seen"? That is quite a compliment! This is a tremendous compliment, for which I am very grateful. So there are some real gorgeous ones out there, no doubt - Mark's comment is truly inspiring to me. On mine, as I noted, I wanted a purpose-driven impliment of fear and malice with a fantasy flair, intentionally moving away from beauty and perfection - which suprisingly seems to have hit a chord with a few. I am amazed at the number of PMs and emails I have got on asking if this one is for sale or I would create a similar as a commission. Perhaps this is something that I will work with Wes Beem / Lonewolf Forge in the future on! Excellent work, Wes & Jonathan, can't wait to see the scabbard. A great visual there on this piece! This one is mine, so I'd not be selling it. Making another one would run in the $425-$450 price range for the seax alone. 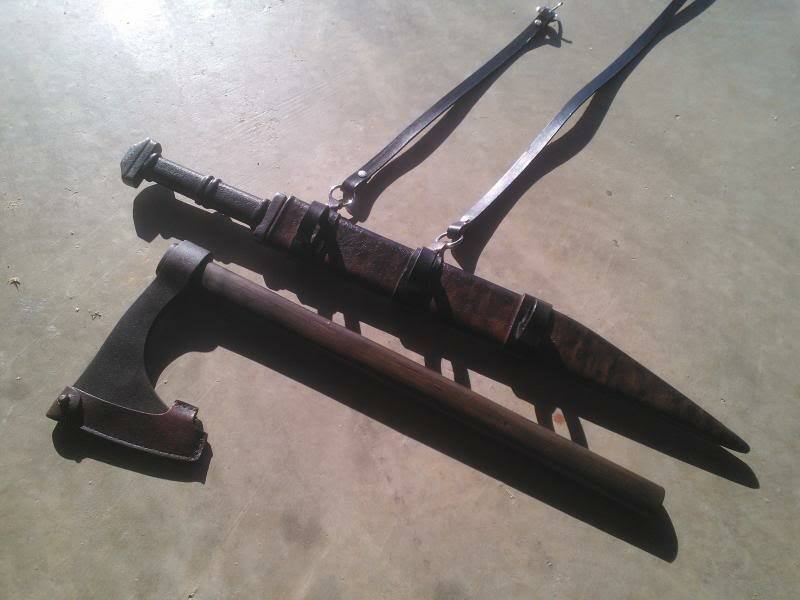 However, I am doing a baldric and suspension for it, which will include an integrated mount for my A&A Nordlund axe. The haft of the axe will hang down the length of the scabbard at the same angle as the grip, so both weapons are contained in one suspension in a nice compact package. Will be working on this over the next few weeks. Really nice! Has a very menacing and strong look about it... all business. Got the scabbard done up. Went with a simple design, which I am going to be trying out. I always wanted to add an axe to a Viking blade on a baldric suspension. Historically accurate? Nope. Do I think it's an awesome way to carry this rig? Yep. I kept it simple to give it a test run over the next few months. The basic scabbard with aged tan wrap was given three leather cuffs, each bearing a ring made from tooling leather. This holds the axe securely along the scabbard and keeps the haft from swinging around. 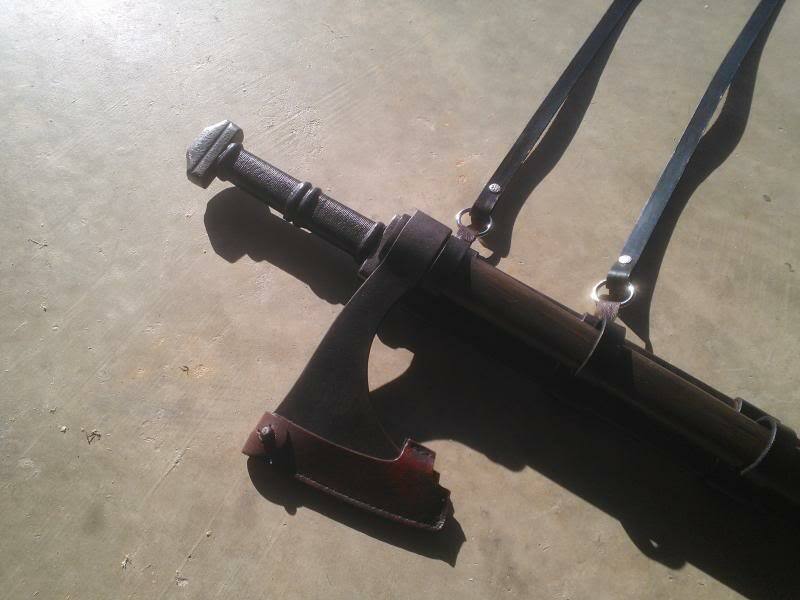 A baldric suspension makes it easy on, easy off, and easy to move around in at events such as faires or conventions. It works just as intended. I am surprised someone did not invent this 1,000 years ago. It just makes good sense, at least for my usage of the package. that little kit certainly appeals to the hunter/woodsman in me. as you say it just seems very piratical to have this kind of set up. I like it. 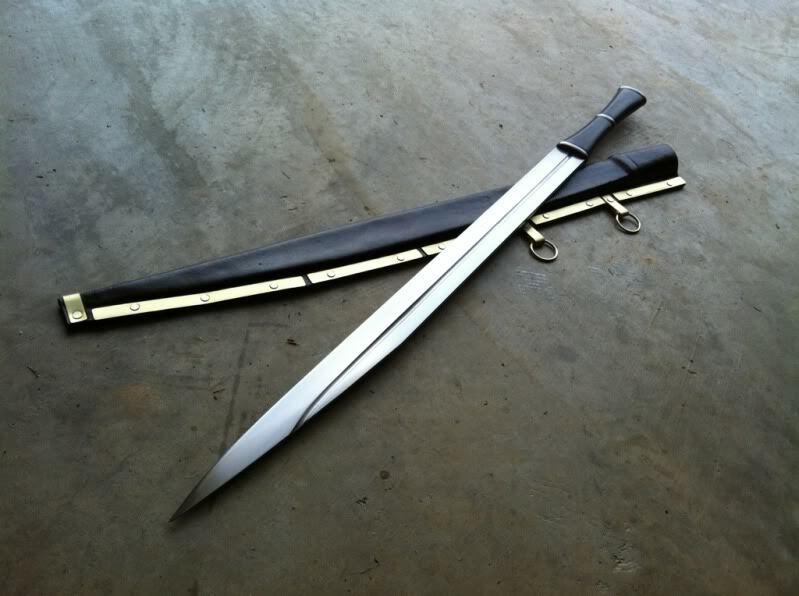 Especially the hilt components and aged look. Perhaps I missed it in the description,but what kind of steel was used in the foging of the blade? Ground from 1095 high carbon steel, 3/16ths inch bar stock.